clearString has a complete range of major Components that cover all aspects of the business world. Their Features enable you to construct the solutions you need, at the scale you need, without hand writing and debugging code. Query criteria and Expressions enable easy data control. Criteria are the logic controls that enable you to manage the data returned by your Queries and to make decisions to fork flows dependent on constants or dynamic values derived from other queries applied through Parameters. The user friendly Expression Builder makes creating complex expressions a snap. A color coded proving cycle helps you get it right. Actions enable you to create the flow of a business process. Designed to be as intuitive as possible in use, each Action is configured using context sensitive dialogs that guide you through the construction process. 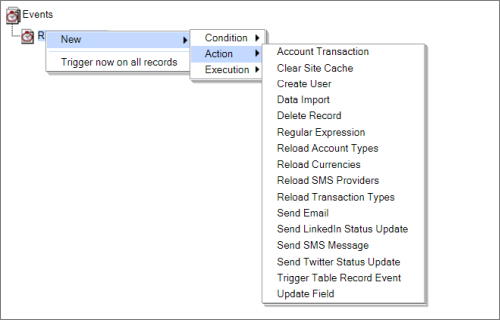 Table Record Events and Field Updates are your gateway to interactive application creation. When events happen is key to Process Management. Controlling when events happen enables the construction of Quality of Service monitoring of business process, keeping track of how long a stage should take and what actions to follow to create Escalation notifications. Events allow the creation of Performance Monitors so businesses can see where bottlenecks are happening - and get notified real-time.